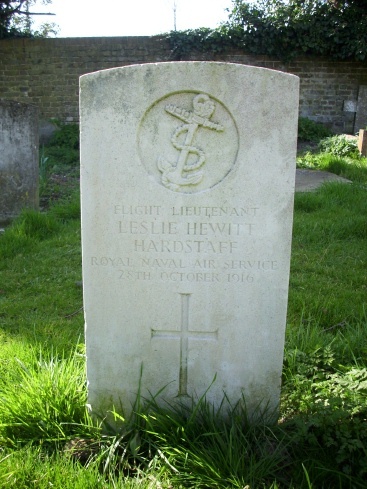 Leslie Hewitt Hardstaff was born in Beeston, Nottinghamshire on 28 December 18912, the eldest of five surviving children of John Richard (b. c1864, Granby. Leicestershire) and Ellen Elizabeth Hardstaff (b. 1871, Ilkeston, Derbyshire née Hewitt). His father, John, was the oldest of the three surviving sons of Thomas who was a very successful manufacturer of wickerware and perambulators in Nottingham, all of whom worked in the family business3. In 1891, John had married Ellen Elizabeth Hewitt, the daughter of William Hewitt, an Ilkeston lace manufacturer4. Unlike his parents and brothers, all of whom settled in The Park, the fashionable area in Nottingham, John & Ellen made their home in Beeston. By 1901, they were living at 23 Meadow Lane, just south of Beeston Station in an area favoured by business people who needed to have an easy commute to Nottingham. 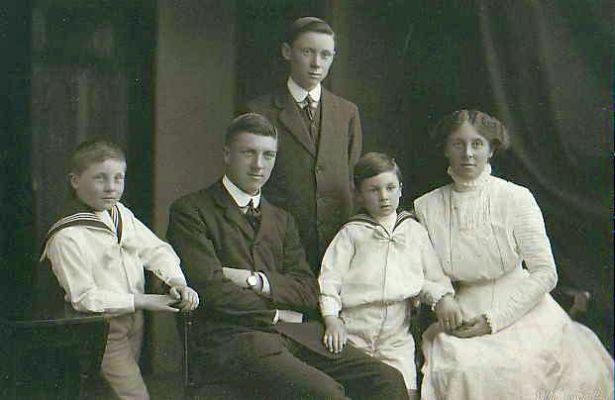 In March, at the time of the census, Ellen was there with their two oldest sons, Leslie - then aged 9 - and 6 year-old Richard, with her brother William, a trooper with the Life Guards who was visiting5. They employed a domestic servant. John was away in Guernsey, on business, as was often the case with him and his brothers, who each spent much of their time as traveling salesmen for the family business6. In January 1905, when he was 13, Leslie became a cadet at Training Ship Conway, a 19th-century wooden ship, then stationed on the Mersey, near Liverpool to commence training for a career at sea. After just over three years, he became a Midshipman - that is, Officer Cadet - and started a period of several years in which at sea, during which he gained practical training and experience, preparatory to promotion. In August 1908 he left on the "Mersey" for Australia in his first round-the-world voyage, traveling around the Cape of Good Hope and Cape Horn on the return. 'Mersey' was an iron-hulled square-rigged sailing ship (shown right) that had been acquired by the White Star Line that year, for use as a training ship for 60 cadets. Between 1908 and 1912, Leslie is known to have made at least four such voyages, as a result, he was granted his 2nd Mate Certificate in September 1911, served as 'Chief Mate' during his voyage in 1912 and was granted his 1st Mates Certificate in July 1913. In June 1913 he was appointed Acting Sub-Lieutenant in the Royal Naval Reserve7. At the time of the 1911 Census, Leslie was away at sea, on his way back from Australia, but his parents were still living at Meadow Road, Beeston in a house named 'The Cottage', now with two more sons, Jack Wilkinson Hardstaff (b. 1902) and Philip Leverton Hardstaff (b. 1904) having joined Richard, their second son8. Later that year, after arriving back from Australia in June and two short tours that summer on HMS Revenge and HMS Roxburgh as part of his RNR role, Leslie and his three younger brothers joined their mother for this photograph. Leslie, then still not quite 20, was now clearly a confident young man9. Mobilisation began in Britain on the day before it declared war on Germany on 4th August and, as a Royal Naval Reservist, Leslie would have been recalled immediately. 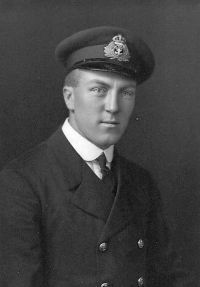 On 16 August 1913 he re-joined for submarine duties as a Sub-Lieutenant. However, his interest in flying was developing fast - perhaps encouraged by Richard, his younger brother, who had gained his aviation certificate in August 1914. Consequently, in March 1915, he transferred to the Royal Naval Air Service, as a Flight Sub-Lieutenant. After training at the Central Flying School at Calshot - probably on sea planes - he was posted to the seaplane development station at Felixstowe in July 1915 - though it is thought that he worked with 'land machines' at this time. On August 1st he had a narrow miss when he lost control of the Schneider floatplane he was flying and it dived into the water and was completely wrecked10. In November 1915 he was posted to HMS Vindex, previously a fast passenger ferry that had been acquired by the Royal Navy and converted to a seaplane carrier. She had been newly assigned to the Harwich Force to operate in the North Sea, continuing in that role until 1917. A Bristol Scout C took-off from the ship on 3 November 1915, the first take-off by a landplane from a Royal Navy ship. It is likely that Leslie was involved in this milestone event. Certainly, by this time, he had gained an excellent reputation as a flyer and as an officer. A contemporary report states that he "handles Schneider Cup Sopwith seaplanes exceptionally well" and was "a very good all round pilot both as regards seaplanes and land machines", he had "flown at night with success and handles men with discrimination" - that latter quality attributed to "his previous experience with the Royal Naval Reserve"11. While his flying career was developing fast, there were also important changes happening in Leslie's personal life. In May 1915, his grandfather, Thomas Hardstaff, had died leaving a large estate which, as we will see, apparently changed the lives of his sons and their families. 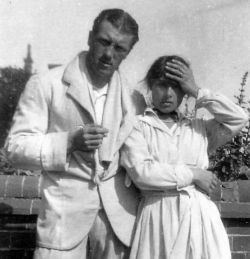 Shortly after this, while stationed at Felixstowe, Leslie had married Gladys Mary Page (shown together right) and, in the late summer of 1916, their daughter, Joan Mary was born in Kensington, London12. On 1 January 1916, Leslie was promoted to Flight Lieutenant and attached to the Admiralty Air Testing Staff at Felixstowe and at the Royal Naval Air Station at Chingford, Essex. Life as a test pilot, involving flights in prototype aircraft in these early days of aviation, was a particularly hazardous one but it was a role that Leslie appears to have reveled in. It was certainly an important role, facilitating as it did the provision of safer and more efficient aircraft for war operations. In May, for instance, he left Chingford, via Dover in the latest Sopwith "Pup" - still in its original finish of natural fabric, varnshed wood and bare metal - for active service trials with A Squadron RNAS 5 Wing at Dunkirk13. On 20 October 1916, he was detailed to speed test a new design of Sopwith Triplane. After taking off from the Royal Naval Air Station at Eastchurch in Kent, he was flying a measured mile, at a height of less than 100 feet at an estimated speed of 130mph, when the tailplane was seen to twist up and down and to buckle. The plane came down nose first and Flight Lieutenant Hardstaff was killed instantly in the crash. Following the enquiry into the accident, a special letter of recognition, paying tribute to his valuable services, was sent to his wife. It was also recommended that, should posthumous honours be introduced, his case should receive consideration14. Flight Lieutenant Hardstaff was buried in the graveyard of All Saints Parish Church in Eastchurch, Kent. He was posthumously awarded the 1915 Star, the Victory Medal and the British Medal15. The loss of a husband, son and father - as for so many others - must have been a huge shock. They would, no doubt, have found some solace in the realisation of the esteem in which he had held and the expressions of sympathy - not least a message from the King and Queen received by his widow. For Gladys, his widow - like so many others at that time - there would be the need to rethink her life with her child. She was to stay in London, living in the Kensington area - albeit with her family in Sussex to fall back on - and, in 1925 she married Reginald Rutherford MacBryan and had two further daughters. She died in 1975, aged 8416. His parent's loss was obviously no less devastating and their worries would have intensified for their second son, Richard Cecil who was also serving with the Royal Naval Air Service, having gained his Aviator's Certificate in August 191417 and enlisted in February 1915 after completing his education at University College, Nottingham. He was to survive the war, having reached the rank of Flight Commander and married Maud Metcalfe in 1916. Afterwards, he was to continue with a career in the Royal Air Force. After a tour of duty in Iraq with 84th Squadron, he took over command of the technical training school at RAF Manston in about 1932, with the rank of Wing-Commander. During this time he maintained a home in Kensington where he and his wife continued to live after he left the RAF18. Their father, John Richard Hardstaff, had been a Captain with the 1st Nottingham (Robin Hood) Volunteer Rifle Corps. This continued when the Corps became amalgamated into the 7th Battalion, The Sherwood Foresters in 190819 and he would have been mobilised at some point during the war. Remarkably, though he was by then aged about 53, he was posted to France in July 1917 as a Lt. Colonel20, a move that can only have increased worries within the family. After his return, it is perhaps not surprising that he and his wife sought retirement, an option that had been made very much more possible after his father's death in 1915 when he left an estate valued at over £75,000 (over £5 million in today's values)21. As one of three sons, he would have benefited to the extent that he had no need to work and, when he moved with his wife to life in Skegness immediately after the war, he appears to have left the running of the family business to his brothers. He died there in 1938, and his wife in 1968, by which time she had returned to live in Nottingham22. Jack Wilkinson Hardstaff, John & Ellen's third son, also took up a flying career in the Royal Air Force. Tragically, in 1923, now a Pilot Officer, he was fatally injured when, on a solo practice flight out of Duxford, his plane crashed at Stanmore Hall Farm, Whittlesford, Cambridgeshire. He was only 20 years old23. 2His birth was registered in Basford Registration District (of which Beeston was part) in Q1/1892 (Ref 7b 185). His full birthdate is given in various documents, including his Service Record at the National Archives. Some documents, notably his Mates Certificates, wrongly state the year as 1892. The Commonwealth War Graves Commission and some other sources wrongly record his birthplace as Skegness. 3The company's factory/warehouse at 44 Canal Street, Nottingham is now a bar and restaurant and can be seen here. Previously, they had operated from premised at Carrington Street bridge. 4Their marriage was recorded in Nottingham Registration District in Q1 1891 (Ref 7b 514). At the time of the census in April 1891, the couple were boarding at 5 Hall Croft, Beeston (Piece 2671 Folio 36)Ellen's brother William was also boarding there. 6Guernsey, Channel Islands : 1901 Census, Piece 5320 Folio 41. 7Details of Leslie's time at TS Conway and his early sea-going career have been collated from details associated with his Mates Certificates and from passenger lists, all available at ancestry.com. The image of 'Mersey' is from the State Library Victoria website (www.slv.vic.gov.au). More about the ship is at en.wikipedia.org/wiki/Mersey_(1894_ship). The associated Wikimedia Commons page has a collection of 25 images showing aspects of cadet life on board the ship. The 'Mersey' is known to have made six round journeys to Australia between 1908-1916. Leslie's records appear to show that he took part in four of these between 1908 and 1913, although his newspaper obituary, stated that he 'had been seven times round the world'. Whichever is correct, it was an amazing achievement and experience for a 21-year-old. 8Beeston, Notts, 1911 Census, Piece 20429 RD429 SD3 ED4 Schedule 238. Leslie's siblings were Richard Cecil (1894-1979), Jack Wilkinson (1902-1923), Philip Leverton (1904-2000) and Neida Helen (1913-1999). 9The image of Ellen Hardstaff with her sons, as well as the other family photographs, were kindly supplied by ancestry.com member 'hardstaff1'. 10The incident in mentioned in a fascinating diary of Sopwith Aviation Company activitied in 1915, now available on the Kingston Aviation website at www.kingstonaviation.org/100-years-ago/1915.html. 11Details of Leslie's wartime service are from his Service Record, held in the National Archives. 12Their marriage was recorded in Woodbridge Registration District, Suffolk in Q3 1915 (Ref 4a 3002). The birth of their daughter, Joan Mary, was recorded in Kensington Registration District in Q3 1916 Ref 1a 136). 13The often hazardous continuing race during 1916, to develop aircraft for miiitary use, mentioning Leslie's involvement, is vividly described in the diary of Sopwith Aviation Company activities, now available on the Kingston Aviation website at www.kingstonaviation.org/100-years-ago/1916.html. 14Details of the fatal accident are from Leslie's Service Record, held in the National Archives. There is another description of the accident in "I Chose the Sky", by Leonard H Rochford (William Kimber & Co Ltd, 1977) which also provides a good description of operational life at Eastchurch at the time. Several sources, including the Commonwealth War Graves Commission and Leslie's gravestone wrongly record the date of his death as 28 October. It was, in fact, 20 October 1916. 15Leslie's medal awards are recorded in the Naval Medal & Award Rolls, available on ancestry.com. 16Her address at the time of her husband's death or soon after, was 7 Nevern Place, Earls Court, London. In 1938 she was living at 7 Redcliffe Gardens, Kensington and, in 1951, she was a 15 Trebovir Road, Kensington. 18His time in Iraq mentioned in "The Royal Airforce - Volume 2 : An Encyclopedia of the Inter-War Years 1930-1930" by Ian Philpott at books.google.co.uk/books?id=XDHAAwAAQBAJ. This also provides an explanation of the RAF involvement in Iraq at that time. In 1939, he and his wife were living at 53 Redcliffe Square, Kensington. 19The London Gazette, September 25, 1908 Page 6951 (www.thegazette.co.uk/London/issue/28180/page/6951/data.pdf). 20Embarkation date and rank are given on his Medal Card, available on ancestry.com. 21Thomas Hardstaff died on 6 May 1915 and his will was proved at Nottingham Probate Registry on 13 August 1915 by Thomas' half-brother, Arthur Hardstaff and his three sons, John Richard Hardstaff. Thomas Wilkinson Hardstaff and Bernard Hardstaff, all described as basket and perambulator manufacturers. Details of how his estate, valued at £75,258 17s 9d, was divided, have not been seen. 22John & Ellen moved to White House, Seacroft, Skegness, Lincolnshire soon after the end of the World War 1 and were still living there at the time of John's death on 20 June 1938. 23His death was on 16 February 1923. It was reported in the Nottingham Evening Post on 19 February 1923. He was John and Ellen's third son rather than their second, as reported.